Disgusting, if people vote for this conservative shower of sh**e. They require their heads testing. does this apply to forcing a group of people into unpaid work?, as the government are doing. does the payment of benefits become a wage, if so there is defo some laws broken here….cos its not even minimum wage.WORK FOR YOUR BENEFITS, BUT WE , THE GOVERNMENT, WILL PAY YOU LESS THAN THE MINIMUM WAGE, this has to be illegal surely. A little advice,I kicked the prescribed JCP+ job searching method into touch after my last appointment,result an interview,only for 25 Hours,but local,no travel costs,here is my question? It is Z-hours,but informed 25 should be no problem,if I apply for Working Tax Credit I need 30 Hours,can I start a 2nd job self employed as a “Window Cleaner”? 5 Hours a week,it is worth £54 pw WTC and this would help especially waiting for the first Months check..Cheers. 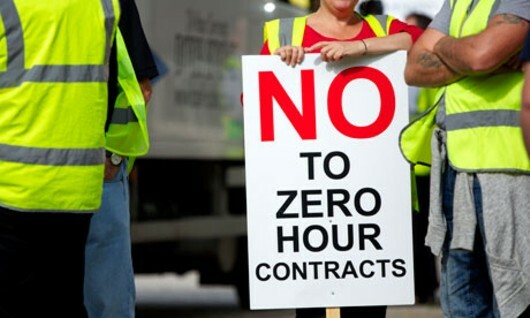 I wonder how many companies in reality would not be able to operate without zero hours contracts, although no doubt some creative highly paid legal bod would come up with something to pretend they can’t. Shared on the Chris Spivey.org forum, thanks! While the promise by Labour to “act” on the ZHCs, why oh why do they always provide a get out clause, under the guise of not being anti-business of course? We all know where that leads. There is no justification for most ZHCs, being in industries where there has always been a high degree of part-time and casualised work. Somehow they muddled through before without these evil contracts. When Labour are returned to power, as they must be to save us from these fascists, we must be prepared to continue the struggle for return of workers rights, and social security entitlement gained 70 years ago – and the return of the NHS to public ownership. The current debate on the rail system has shown that there is still massive support for the previous status quo, without putting monopolies into the hands of cartels and profit-takers from public services. We need unions like the French have. If the French don’t like something, they have all manner of ways, some legal, some not, of showing their disapproval. Whilst those in the UK either do nothing or idiotically riot and smash things up. I think that once again Labour are just mouthing their opposition, and once they get into government it will be ‘business as usual’ and on with implementing Tory policies. Anyone who seriously believes that Labour will make any real changes is sadly deluded. There is an alternative union for workers in the UK that is outside the mainstream. It’s called the Industrial Workers of the World, founded in Chicago in 1905 and is radically different to the craven mainstream TUC unions – though many members of the IWW are ‘dual carders’ (also memebers of mainstream unions) fed up with the spineless inactivity of both the mainstream unions and the Labour Party. In my experience its union membership that are spineless not the unions them selves.